Studying rivers can be unpredictable. Boats can get tossed around by currents and make buoy deployments difficult. Wildlife and debris in the water often get in the way. To get around Mother Nature’s whims, researchers at the University at Buffalo have built their own model rivers. Chris Lowry, an assistant professor of geology, uses one of the scale models to study groundwater discharge in rivers and streams. But he does it in a way few others do, using temperature as a tracer. “Using temperature as a groundwater tracer is something that’s been around for a while. It has a lot of great applications, but it’s underutilized,” said Lowry. He can model the interaction between groundwater and surface water, which helps for verifying field results and makes it easier to locate groundwater hotspots in real rivers. The results are important for restoration projects and stream monitoring. The method involves pumping cold water up through an artificial streambed made of sand. The surface water, meanwhile, is heated and cooled to mimic the temperature change water undergoes in a typical day. By measuring the effect that the cooler simulated groundwater has on the warmer surface water, it’s possible to chart how the simulated groundwater spreads. The tank Lowry uses is made with a metal frame, fiberglass and marine-grade plywood. It’s five meters long, a meter tall and about 60 centimeters wide. 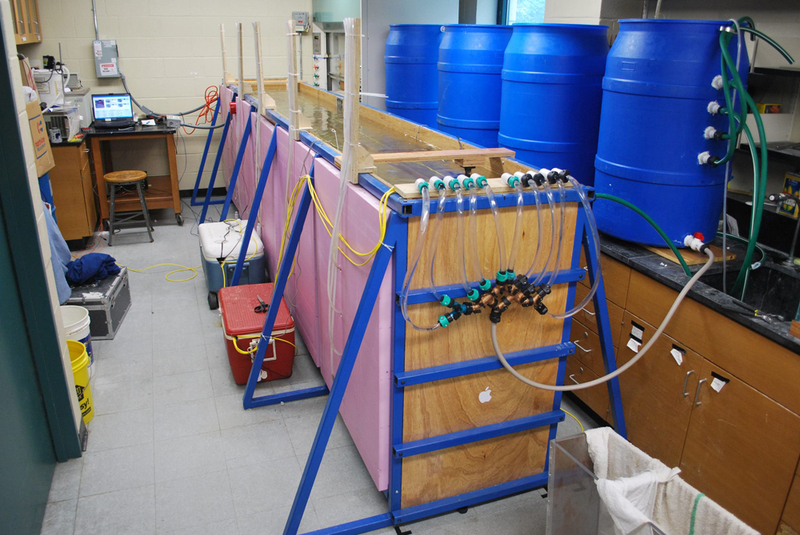 A divider in the middle separates water going up one side and down the other, making a study area of 10 meters. Perforated pipes at the stream bottom pump in the cooler water, which ranges from 8 to 10 degrees Celsius, and Lowry can control where that water is introduced in the stream. Sensornet fiber optic cable detects temperature changes and two HOBO temperature loggers confirm them. The cable is buried in the sand. Lowry says using temperature as a tracer is very easy and cheap, noting that the probes used only cost a few hundred dollars. It’s a very useful technique that he says people are overlooking. It would be easy to change the streambed materials to mimic other environments. Changing from sand to a mix of clay, gravel and other sediment would be simple. As the research progresses, other tracers could be used as well. But Lowry is focused on a temperature tracer for now. “I’d like to benchmark this technique, to make it a standard that people use to start to identify where groundwater is discharging and how much,” said Lowry.